Try our Happy Birthday Cookie Cake as a great substitute to traditional birthday cake! Our giant 10" cookie feeds up to ten, and decorated with a colorful fondant birthday design. Rolled fondant printed with 100% edible-ink over the cake. The party can begin when this Giant Birthday Cookie Cake arrives! Delivery of this sweet alternative to a birthday cake will bring smiles. Our Birthday Cookie Cakes say, Happy Birthday! and is filled with a generous supply of chocolate chips. This delivery of the 10 inch Giant Happy Birthday Cookie Cake decorated with a colorful fondant birthday design. Rolled fondant printed with 100% edible-ink over the cake. We even throw in a box of candles with the mail order delivery to make your party complete! This product is fresh baked and does not include nuts. 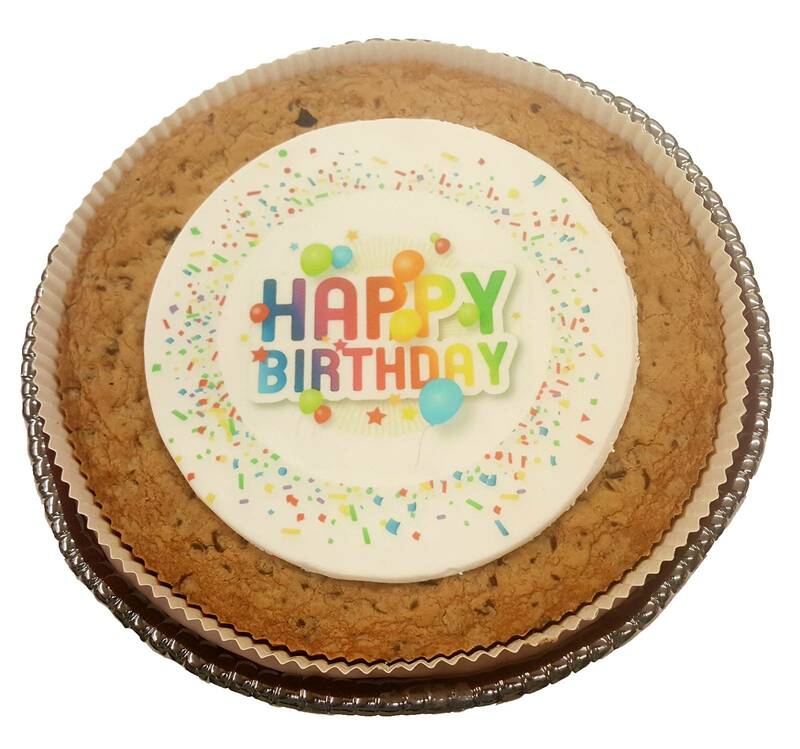 The Large Happy Birthday cookie cake is a two pound cookie which is the equivalent to 32 one ounce cookies. So, call all your friends and have a party!! Birthday Cookie Cakes are a great gift for sending to a college or to an office for a birthday surprise!